Callao Salvaje is a small self contained residential town and holiday resort, that is part of the municipal district of Adeje on the west coast of Tenerife. Looking at a map of the west coast, it is very easy to miss the town altogether, although if you look closely enough you should find it hidden away between the resorts of Playa Paraiso and Playa de La Arena, approximately 12km north west of the infamous resort of Playa de las Americas. There are quite a few bars and restaurants along the seafront and a couple of supermarkets. 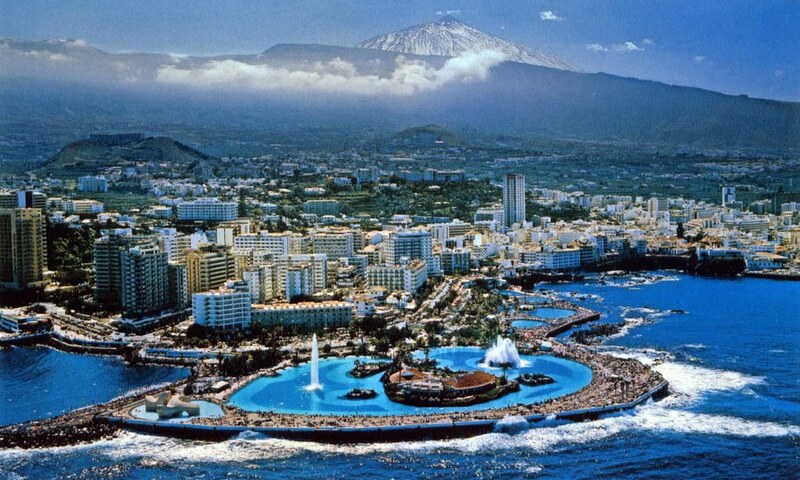 The resort of Playa de Las Americas is located on the southwest coast of Tenerife, where there is reputedly the best sunshine record on the island. The Beach of The Americas was named to commemorate one of the last places visited by Cristopher Columbus before setting sail for the New World. Since then however, the resort has changed a great deal and now offers an extensive selection of amenities. The resort centre offers a staggering choice of restaurants to satisfy all requirements; a selection of beaches offering a variety of water sports, a waterpark and an abundance of nightlife. The El Camison beach and promenade have greatly improved the area with deluxe hotels, designer shops, theatre and casino. Reina Sofia airport is approximately 18 kilometres away. Located just west of Playa de Las Americas, and incorporating the ares of Torviscas, Playa Fanabe, La Caleta, Playa Paraiso & Callo Salvaje lies Costa Adeje. 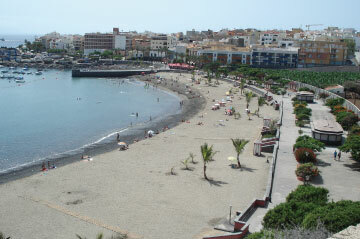 Due to its long coastline, Costa Adeje has a wide assortment of accommodation, all priced and sized to meet your needs. Some of the islands finest hotels are situated in Costa Adeje, and the same can be said for the self catering apartments & villas located in the ‘newest resort’ of South Tenerife. Reina Sofia airport is between 20 – 30 kilometres away. 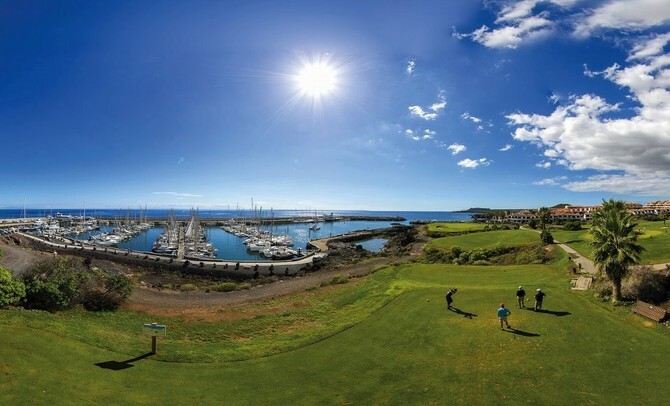 Golf del Sur and Amarilla Golf are approximately 15 minutes drive away from Reina Sofia Airport and as the names would suggest are popular golf resorts. Golf del Sur has a 27 hole championship golf course and Amarilla Golf has an 18 hole golf course. Both are low key resorts and attract visitors of all nationalities who want a relaxing holiday in peaceful surroundings. The San Blas commercial centre has a wide and varied selection of bars and restaurants, some offering nightly entertainment and plenty of shops to browse around, whereas the promenade to the new marina between Golf Del Sur and Amarilla Golf has seen some lovely new sea front restaurants open up, which are great settings for an evening meal overlooking the Atlantic Ocean. The village of El Medano, known for its ‘International wind surfing competitions’ is located close by and the tiny fishing village of Los Abrigos, popular for its restaurants is 5 minutes away by car. The small coastal village of La Caleta is part of the municipal district Adeje, approximately 25km or 15 miles west of the Reina Sofia International Airport. Looking at a map of the west coast of Tenerife, it is very easy to miss the town altogether, although if you look closely enough you should find it hidden away between the resorts of Playa Paraiso and the more infamous Playa de las Americas. Although it has a stone beach, taking a short half an hour walk to the south will lead you to some small coves of golden sand. On all the surrounding beaches, you can hire sun beds, pedal boats and wet bikes. Once a small, quaint fishing village, Los Cristianos has been gradually transformed into a thriving port and a sophisticated holiday resort for families and couples alike. It has managed to retain much of its original charm with traditional Canarian style buildings, a pretty plaza and pedestrian shopping areas. There is a colourful Sunday market, a horseshoe shaped sandy beach and a good selection of shops, pavement cafes and good quality restaurants. A favourite pastime is strolling along the harbour and watching the many fishing boats return home as the sun sets over the Atlantic. Reina Sofia airport is approximately 15 kilometres away. Simply stunning is the first thought that enters your mind. With the little beach of black, volcanic sand surrounded by the tall majestic cliffs and clear waters, Los Gigantes is stylish and relaxing. Although much quieter than the resorts of Los Cristianos and Playa de Las Americas, both the Los Gigantes marina and central square are lined with bars and restaurants to suit most tastes. 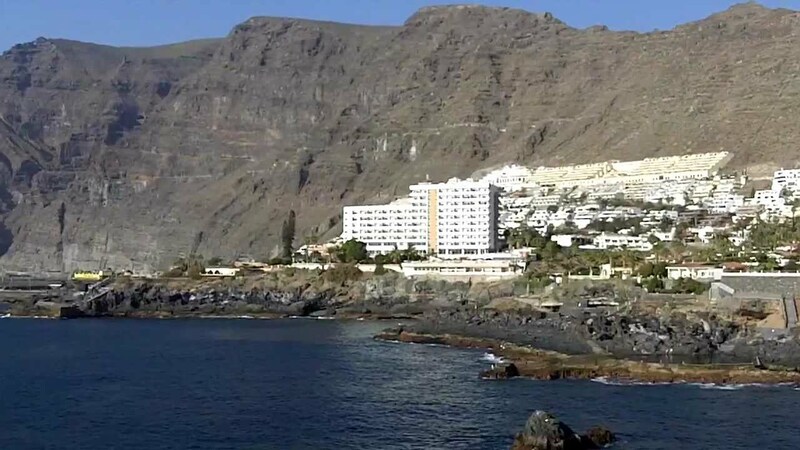 Los Gigantes is a starting point for many tours and a main harbour for boat trips making this resort a good base for exploring more of Tenerife, and a drive through the fascinating Masca Valley or a trek to the Parque Nacional de Las Canadas are a must. Reina Sofia airport is approximately 45 kilometres away. On Tenerife's sunny southwest coast, between the two more well-known resorts of Playa de Las Americas to the East and Los Gigantes to the West, lays the tranquil and pretty fishing village of Playa San Juan. This small village has maintained its typical Spanish character, and is the ideal place for those wishing to experience the true Canarian lifestyle. A selection of bars, restaurants and outdoor cafes can be found along the Avenida Maritima. With the local council of Guia de Isora investing in keeping Playa San Juan remote, yet interesting, the greenest resort on the south of Tenerife will gradually appeal more and more to those looking for sun and tradition. Reina Sofia airport is approximately 35 kilometres away. Puerto de La Cruz is situated on the north coast of Tenerife and has a mild climate, lush vegetation and beautiful scenery including views of the Orotava Valley and Mount Teide. It is one of the oldest and most attractive resorts on the island which retains much Old World charm with many buildings dating back to the 18th Century. There are many churches, pretty squares, fashionable seafront cafes and endless shopping possibilities. Manmade attractions include the famous Botanical Gardens, The Loro Parque Zoological Gardens, Casino and large manmade lake, Lago Martianez, where people can swim and relax. This is an ideal base from which to explore the lush Orotava Valley, the dramatic scenery of Las Canadas National Park or the typical Spanish towns and villages that are dotted along the north coast of the island. Reina Sofia airport is approximately 100 kilometres away. Book with Confidence. We are a Member of ABTA which means you have the benefit of ABTA's assistance and Code of Conduct. We provide financial protection for your money when you buy a package holiday. If you buy other travel arrangements such as accommodation only this protection may also apply. Please contact us for further information. The core information displayed covers Tenerife holiday villas and apartments including our range of select luxury villas and apartments . The site showcases our beautiful range of holiday accommodation throughout Tenerife including apartments, villas and hotels. Our portfolio varies from luxury villas, golf villas and spacious apartments, through to hotels or more modest holiday accommodation but all available in well-known popular Tenerife resorts. 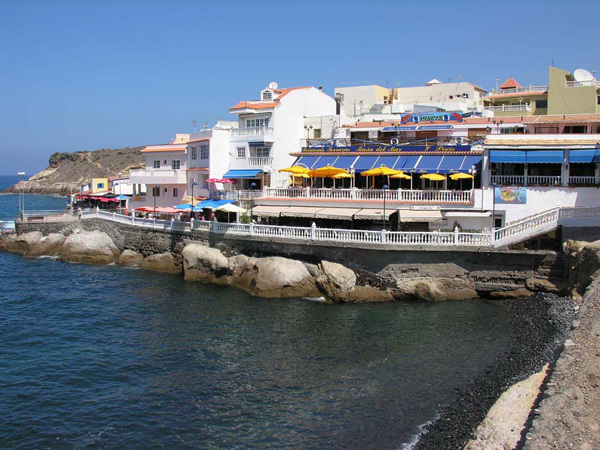 The Site gives wide ranging Tenerife holidays information including currency, resorts, and history. As we have lived in Tenerife, we have local knowledge which gives us the edge in offering the finest Villas and Apartments in Tenerife. We also feature our Parque Santiago Apartments in Playa de Las Americas. The popular Parque Santiago Apartments and villas in this resort offer good self catering accommodation with brilliant facilities. Accommodation in the Parque Santiago apartments is in studios, 1 bedroom, 2 bedroom or 3 bedroom Apartments as well as 3 or 4 bedroom Villas. Contact us for information on the best possible Tenerife Apartments and Villa Holidays including villas and apartments in close proximity to the golf courses at Adeje, Golf Las Americas, Golf del Sur, Abama and Amarilla for Golf in the south, as well as Puerto de La Cruz in the north. Tenerife apartments and Villas are located in Playa de Las Americas, Los Cristianos, Puerto de La Cruz, Los Gigantes, Golf del Sur, and Playa San Juan.